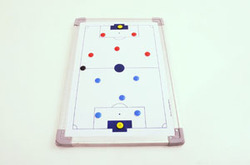 Soccer field design on a magnetic surface with buttons. Size – 45cm X 30cm. 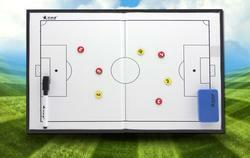 - Magnetic coaches folder has field printed on left side and on right side it has clip to hold strategy sheets. - Comes with Magnetic Counters & Marker. - Available for Soccer, Rugby, Volleyball, Hockey, Basketball, Handball etc. High quality Tactic board. Ultra light , Super strong . Comes with Meganatic counters , Marker , Eraser . Sizes 60cm , 90cm 120cm . PRICES ARE EXCLUDING TAX SHIPPING. Made of 3 mm Acrylic sheet. Size : 9" x 16". - Magnetic write on wipe off white board front & back. - Most effective tool for tactic training for coaches. Board for all major Sports, must for coaches, instructors.